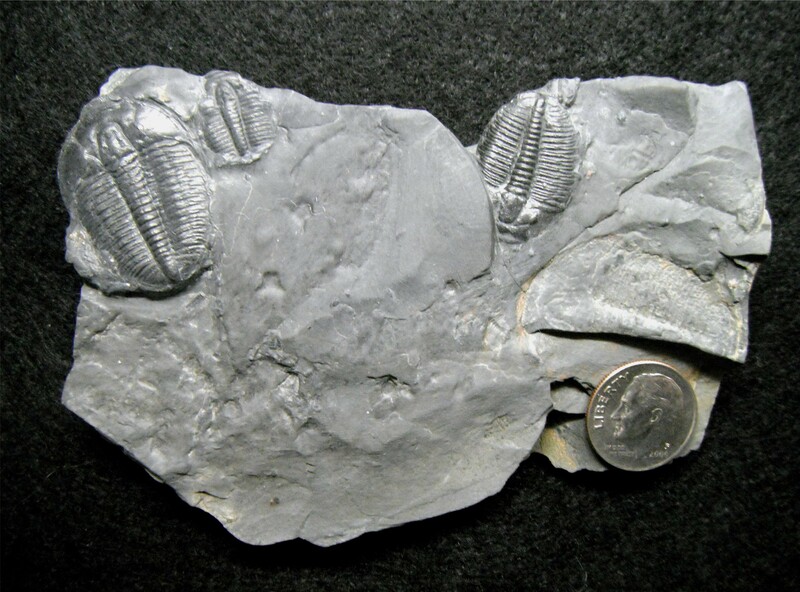 Most fossil collectors love to find trilobites but usually hate the difficulty of finding a whole one. It turns out there is a very good reason why most trilobite fossils are “partials.” Partial fossils usually represent shell material molted from a living trilobite during growth stages, while complete fossils preserve the remains of a dead animal itself. So, rocks containing mostly fossil parts usually represent ancient marine environments which were healthy for trilobites, while rocks rich in complete fossils represent less hospitable conditions. Fortunately for trilobites, there appear to have been many more of the good environments for most of their 275-million-year span of existence. One area of the Southwest is a much better environment for modern fossil collectors than it was for trilobites. That area is the House Range, a massive stack of Paleozoic sedimentary rocks several thousand feet thick, west of Delta, Utah. Near the base of the range there are several formations of dark shale, all of which contain fossil trilobites, a high percentage of which are complete. These shales host a number of well-known trilobite collecting localities in the range, but the most famous is the Antelope Springs area. Chances are, if you have ever seen a finely-detailed black trilobite perched on the surface of a dark gray shale, it came from Antelope Springs. There are many areas to collect fossils successfully around Antelope Springs, all of which are outcrops of “limy shale” of the Middle Cambrian Wheeler Formation. This rock is gray to black and composed primarily of clay, cemented by calcite. Abundant fine carbon material within the clay matrix gives these rocks their dark color. Small amounts of pyrite and gypsum are also locally present. Apparently, the environment in which this shale was deposited had poor water circulation and at times became toxic to bottom life, which also included small brachiopods. Most of the fossils in this shale have had their external shells partially replaced by silica [SiO3]. This hard material is responsible for both preserving fine details and creating a much more durable fossil. Antelope Springs was once a great place to pick up good fossils on weathered shale chips lying around on the ground. Those days are long gone, however, and most good specimens are found these days by excavating slabs of shale and splitting the rock along its bedding plane. The shale splits rather easily, but in most outcrops getting out slabs of fresh rock from the trilobite-bearing zones is another matter. And that is where the fee collecting site U-DIG Fossils comes in handy. U-DIG operates their quarry as an active specimen mining site, and continually excavates access to the best trilobite-bearing zones. This provides virtually anyone willing to pay the fee with the opportunity to find high-quality trilobites, with modest effort, in a short period of time. Currently, the U-DIG website (www.u-digfossils.com) lists adult fees ranging from $28 for two hours up to $70 for a full day of collecting. Children’s fees are less. Use of a hammer to split the shale and a bucket to carry specimens comes with the fee. The quarry staff also provides assistance on how to collect the fossils and the best areas in which to find them. Collectors are allowed to bring their own collecting tools, and are responsible for their own gloves, safety glasses and packing materials. Collecting goes fast at U-DIG, with little overburden to move and most exposed layers containing trilobites. 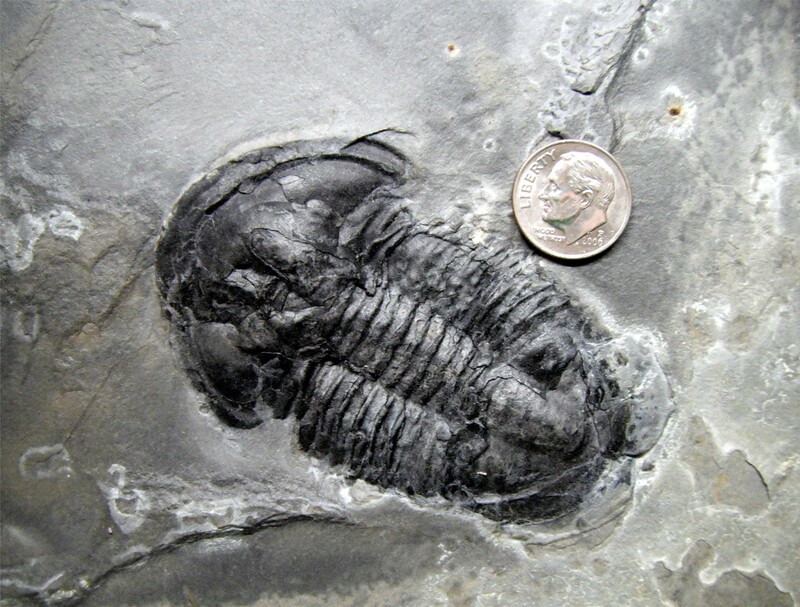 Nearly everyone finds several complete trilobites within two hours, and within a half-day are certain to have found at least a couple of large specimens. Many of the best-preserved trilobites require little cleaning, but some very good partially-exposed specimens may be worked out with a sharp dental pick and a Dremel tool steel wire brush. Once you have freed one of these ancient arthropods from its long stay inside the shale, you better understand why they are still as eagerly sought and studied as when first found over a hundred years ago. The House Range itself is a scenic part of the Basin and Range geographic province, with good places for dry camping, shade from junipers and pinion pines, and great desert vistas. The U-DIG site is at 6,550 feet elevation, so the collecting season is limited by weather to late March through October. Because of the high elevation, the sun is very intense, and sunscreen, sunglasses, a good hat and lots of water are necessities in summer, when days usually top 90 degrees. In addition to fossils, there are also several famous mineral collecting localities in this general area, including Topaz Mountain locality and the Dugway geode fields. But that is another tank of gas for another day. LEARN MORE ABOUT TRILOBITES at the HDM website. We usually have a few for sale too if you’d like your very own trilobite without all the work! 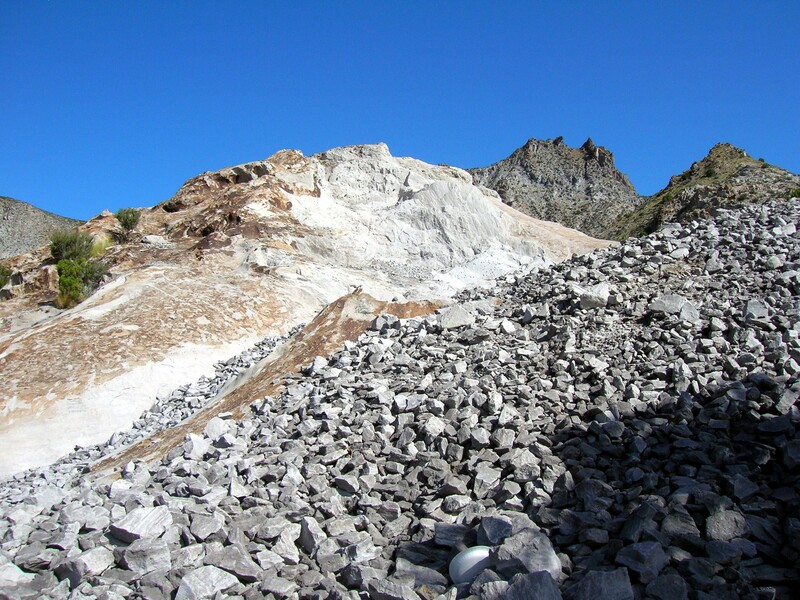 Several decades ago, a trip to the Topaz Mountain rockhounding area in the Thomas Range northwest of Delta, Utah, was often the highlight of a mineral collector’s year. 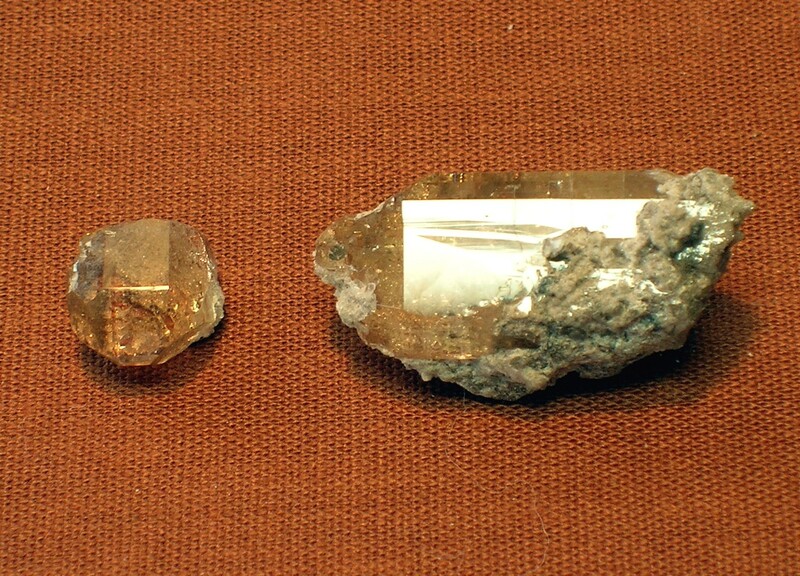 Topaz Mountain, true to its name, hosts transparent, champagne-colored topaz [Al2SiO4(F,OH)2] specimens deposited in small cavities in a Miocene-age rhyolite lava dome. These open spaces were once filled with superheated volcanic gases, from which the topaz was deposited, as the gases slowly cooled. Other minerals also present within these cavities include thumbnail and micro-sized crystals of drusy quartz [SiO2], specular hematite [Fe2O3], bixbyite [(Mn,Fe)2O3], pseudobrookite [Fe2TiO5] and red beryl (Be3Al2Si6O18). 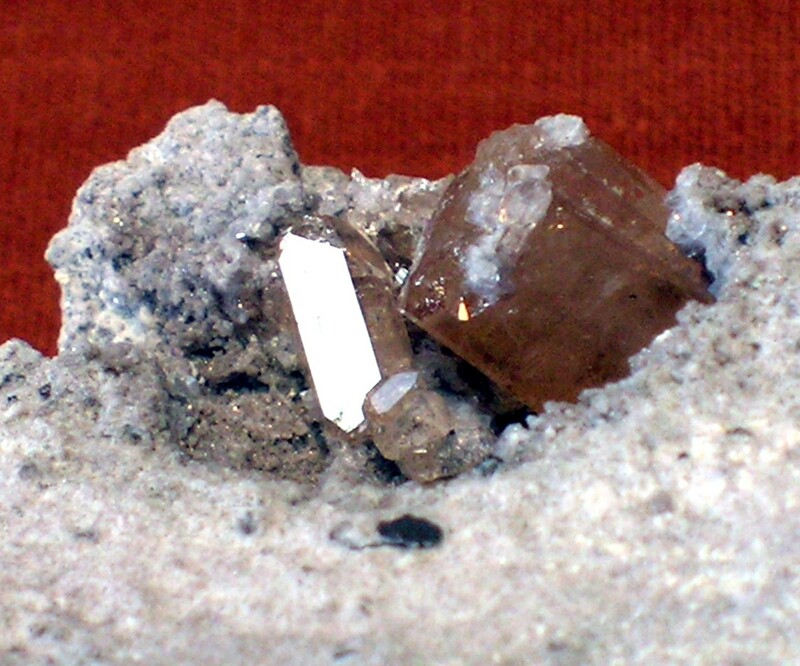 With a good hand sledge, a couple of sharp chisels and a gadbar, a few hours’ of hard work would usually reward each collector with at least two or three classy topaz crystals a half-inch (12 millimeters) or more in length, often on matrix, and several specimens of the other minerals. These specimens were reasonably easy to collect from outcrop exposures and loose boulders. The Topaz Valley at the south end of the mountain was the favorite collecting area, and also a nice place to camp. Back then, the road in the wash going into the valley used to sparkle with tiny shards of topaz in the soil. This August (2011), a friend and I made our first visit to Topaz Mountain in a decade, and as Marvin Gaye once sang, “Things ain’t what they used to be.” Years back, early on a day in midsummer, there were enough rockhounds in the valley that parking places near the prized, rocky hill known as The Knob were hard to find. But this August there were more pronghorns than people in the Topaz Valley; we were the only visitors besides several ATV riders. Once we reached The Knob the reason hit us. There was nowhere left to put a chisel into what is now left of the rocky outcrop! Even the backside of what was once The Knob is now skinned off to smooth, hammered rock. The outcrop walls of the valley, especially the west wall, have also been skinned nearly smooth. The only accessible rocks to break without extensive work with heavy sledges, chisels and large prybars were boulders in the washes. After several hours of boulder-busting, we together found several good and half a dozen fair thumbnail specimens of topaz, and several other fair small matrix pieces. We did not find any of the less-common minerals, but counted ourselves lucky to have found anything at all. Most of the sparkle is even gone from the road – someone has apparently even screened the wash for all but the tiniest shards of topaz. There is still plenty of topaz deep in the rhyolite of the Thomas Range, but do not expect to find it easily. Plan to work hard and stay late, and take plenty of water. It just might be worth the effort!